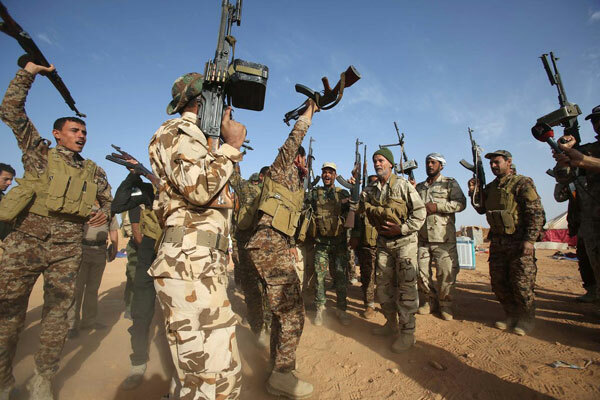 JNN 24 May 2015 Baghdad : Iraqi security forces and allied militias on Saturday retook control of a small town in east of Anbar provincial capital city of Ramadi after heavy clashes with Islamic State (IS) militants, a provincial security source said. The troops backed by brigades of Shiite and Sunni militias, known as Hashd Shaabi, or Popular Mobilization, managed to free the town of Huseibah al-Sharqiyah, some 10 km east of Ramadi, after fierce clashes with the IS militants who seized the town late Thursday, the source told Xinhua on condition of anonymity. The troops and allied militias started their advance earlier in the day toward the town from their bases in Habbaniyah airbase and the nearby town of Khaldiyah, some 80 km west of the capital Baghdad, the source said. “The troops have freed the police station as well as surrounding buildings and houses after they drove out the Terrorists,” the source said. Huseibah al-Sharqiyah is a town with a cluster of houses and a few local government buildings located on the main road between the town of Khaldiyah and Ramadi. The operation to liberate the town is part of major counter-offensive designed to free Ramadi, some 110 km west of Baghdad, which fell in the hands of the IS Terrorists after deadly battles last week. After the fall of Ramadi late Sunday, thousands of security forces and allied Shiite militias backed by columns of armored vehicles and tanks moved from Baghdad and other Iraqi provinces to converge at Habbaniyah huge military base. The rapid retreat of the security forces and allied Sunni militias from Ramadi pushed Iraqi Prime Minister Haider al-Abadi, also the commander-in-chief of Iraqi armed forces, to order the mainly Shiite militias of Hashd Shaabi to prepare to participate in battles against IS Terrorists in Anbar, ignoring U.S. concerns that the presence of Shiite militias could spark sectarian strife. The IS group has seized most of Anbar province and tried to advance toward Baghdad during the past few months, but several counter attacks by security forces and Shiite militias have pushed them back. The security situation in Iraq has drastically deteriorated since last June, when bloody clashes broke out between Iraqi security forces and IS militants. This entry was posted in Iraq News, Middle East and tagged Anbar, Baghdad, Iraqi force, Iraqi security forces, IS, Ramadi, Re Capture Town, security forces. Bookmark the permalink.